Place chopped onion, garlic cloves, bay leaf, paprika, salt, and 1 tablespoon olive oil into saucepan. Cook and stir over medium-high heat until onions start to soften, about 5 minutes. Add white wine to create the braising liquid. Bring to a simmer. Transfer octopus into braising liquid, turning to coat with the liquid. Cover; reduce heat to low. Simmer 20 minutes and turn octopus over. Continue cooking until octopus is tender, another 40 to 45 minutes. Remove from heat; transfer octopus to a large bowl. Pour braising liquid over octopus. Place bowl above a bowl of ice water to cool to room temperature. Cover bowl with plastic wrap when octopus and liquid are cool. Refrigerate until thoroughly chilled, at least 2 hours or overnight. Transfer octopus to a work surface and mop off braising juices with paper towels; remove as much of the purple skin as you want. 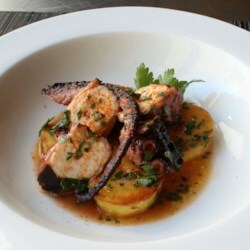 Cut octopus into 3 or 4 serving-size pieces. Brush with olive oil. Transfer braising liquid to saucepan. Bring to a boil; remove from heat. Strain out solids; transfer liquid to a mixing bowl; let cool about 10 minutes. Stir in lemon juice, extra-virgin olive oil, parsley, salt, and cayenne pepper to make the serving sauce. Heat a grill pan or outdoor grill to high heat. Transfer octopus pieces to grill. Cook until flesh is seared, almost charred, 3 or 4 minutes. Turn and cook other side until dark brown, caramelized, and heated through, another 3 or 4 minutes. Transfer to a platter. Slice octopus into fairly thick diagonal slices. Place on a serving dish. Spoon braising liquid mixture over the top. Dust with a bit of cayenne pepper, if desired.